GERMANY: The move towards competitive auctions for wind-power development is driving rapid progress in turbine design. Germany's leading onshore supplier Enercon is responding to the changing market conditions with a radical new design. Enercon will unveil details of a radically new modular product platform at the Brazil Windpower 2017 conference in late August. The 3.5MW E-126 EP3 turbine with a 127-metre rotor spearheads the German manufacturer's ambitious transformation process into future products, initiated by a "technology roadmap" drawn up in autumn 2016. The E-126, designed for medium-wind IEC IIA sites, will be followed by a 3.5MW E-138 for low-wind deployment and a low-wind EP4 prototoype during 2019. "The fundamental question we asked ourselves was: where do we want to be heading regarding technology and product development?" said Enercon sales director Stefan Luetkemeyer. "A key contributing reason behind this roadmap development are the major changes currently taking place in the wind industry. This involves Germany's new auction system, characterised by many uncertainties, and a major role for community-initiated onshore projects. "Ongoing projects are based upon existing permitting procedures, but for future projects falling under the competitive auction system, a one-page document is sufficient to commence project planning," he said. 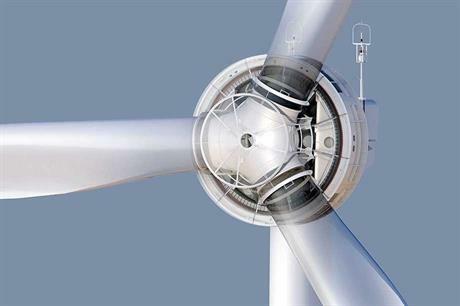 The auction system has already prompted several announcements of new turbine models with super-size rotors from competing manufacturers, and Enercon has to at least keep pace with the increasingly fierce competition, Luetkemeyer said. As part of the technology roadmap study, a core team of experts reviewed the strengths and weaknesses of Enercon's current turbine technology, and established potential opportunities aimed at increasing competitiveness and lowering the levelised cost of energy (LCOE). "Our turbines are known for their long life, performance, reliability and robustness, but are, by comparison, rather heavy and expensive," according to Luetkemeyer. "The main reasons are that Enercon design characteristics far exceed IEC class requirements, and that all our turbines are fitted as standard with features that competitors offers as options, such as cold-climate operations. Our current transport logistics, site assembly and installation processes are lengthy, too." All future Enercon turbines will be based on the new design approach and will meet IEC wind class demands exactly, rather than exceed them. They will be further developed in a basic "naked" configuration with multiple dedicated options made available depending on environmental and operating circumstances. Reducing mass, transport logistics, installation time and cost are the key design drivers, said Enercon's head of systems engineering, Arno Hildebrand. He showed an artist's impression of the new compact nacelle layout, which bears a close visual resemblance to the first 500kW E-40 direct-drive turbine (right) introduced in 1992. It also represents a departure from the iconic egg-shaped nacelle design that has been a distinct feature of Enercon turbines for 27 years, from the 100kW E-20 to the latest 4.2MW EP4 series (see below). "Our new nacelle design consists of three individual modules," said Hildebrand. "The complete hub, including spinner and all electrical parts; a segmented generator; and a rear section incorporating the main carrier. Each module is pre-assembled and pre-commissioned under controlled conditions inside the factory, then individually transported to the construction site where full installation — except the blades — now requires only three single hoists." Easier scalability is another key benefit of the modular concept approach, Hilbebrand said. Increasing the diameter and length of the generator, for example, no longer directly impacts the nacelle's shape and outer dimensions, unlike the incorporated generators in the egg-shaped nacelle. The proven generator electrical-excitation principle is retained, but many other things have changed. The generator voltage level has been raised from 400V to 690V starting with the E-138 EP3. Also new for both the E-126 and E-138 models is a generator with the same 7.5-metre airgap diameter as the EP4 range, but shorter in length, together with the use of air cooling. Another technology switch is from "endless" multi-strand copper wires to pre-manufactured aluminium form coils. "When we started with direct-drive generators in 1992, the use of form coils with multiple connections was not considered reliable enough for undisturbed 20-year generator operating life," said Hildebrand. "Today, it has become proven technology and offers substantial manufacturing time and costs savings. "The same applies for voltage level, and raising voltage reduced aluminium use. We carried out initial generator tests with copper from coils, but for the commercial products we switched to aluminium because it is far less sensitive to world market price fluctuations." As Hildebrand explained, aluminium is much cheaper than copper and only 30% of its weight. In addition, the enlarged generator diameter reduces demand for active materials, especially aluminium and magnetic steel, and it boosts generator efficiency through a higher pole speed with unchanged rotor revolutions. The other side of the coin is that aluminium has only 61% of the conductivity of copper, but the associated generator efficiency loss is compensated for by the increased generator diameter. Enercon's current models all feature a drivetrain with a stationary and partly hollow shaft (pin), two bearings incorporated in the rotor hub, which in turn is directly attached to the generator-rotor. To conduct service activities in the hub spinner, technicians have to pass through hatches in the generator. The new main bearing solution functions according to the same technology principle, but comprises a shorter large-diameter hollow shaft and, again, two pre-stressed bearings. The main difference is that the bearing assembly is now incorporated in the generator structure, and the large hollow shaft enables easy service personnel passage to the hub's internals. The new nacelle design, without a large streamlined spinner, means that it makes little sense to use blades with flat-back aerofoil and a spoiler extending to the spinner, according to Hildebrand. "We have therefore developed a new generation of single-piece slender blades made in glass fibre-reinforced epoxy, with a flat-back aerofoil and incorporating a conventional blade-root section. They are yieldand mass-optimised but do not contain carbon for manufacturing, end-of-life disposal and lightning protection reasons," he said. "That these blades can now come combined in one piece is enabled by the great advances made in specialised blade transportation equipment in the last few years. Another benefit of single-piece blades is that they offer additional time and cost savings by skipping otherwise necessary segmented-blade on-site assembly." The introduction of the two new EP3 models will be conducted in predetermined careful steps, said Luetkemeyer. "The first step involves the fitting of an EP3 test carrier with the 115.7-metre rotor from our existing E-115 turbine. This is planned for the first quarter of 2018, and will be our new-generation concept turbine used for testing and validation purposes. "The primary aim of the whole development process is the E-138 EP3 with a rotor diameter of 138 metres. Coping with an increase of swept rotor area of more than 42% compared with the E-115 and associated loads is enabled by lowering the wind class from IEC IIA to IIIA, and, in parallel, by reducing available design reserves to IEC IIIA demands," he said. The EW-126 EP3 prototype has the new nacelle, and the new design generator already features aluminium form coils, though it still operates at 400V level. This turbine will generate about 13% more energy than the E-115 at IEC IIA sites with wind speeds of 8.0m/s at hub height. The prototype is planned for Q3 2018, with series production starting by the end of next year. The E-138 EP3 operates at 690V level, and incorporates a new in-house developed active converter that increases electrical system efficiency, or could reduce generator dimensions for similar output. The prototype is planned for December 2018 with series production to start in late 2019. "Here we need more time for testing and validation because it is the more comprehensive development of the two models," said Luetkemeyer. "The experiences gained with the new EP3 models will be incorporated in the planned low-wind EP4 turbine, and we expect to install a prototype of this in late 2019. "Many technology changes were introduced with these new EP3 turbines, including choices to offer a better match with IEC-class demands. "But our key focus — offering the highest possible quality and LCOE performance for a 25-year operating life to our customers — remains unchanged," Luetkemeyer added. 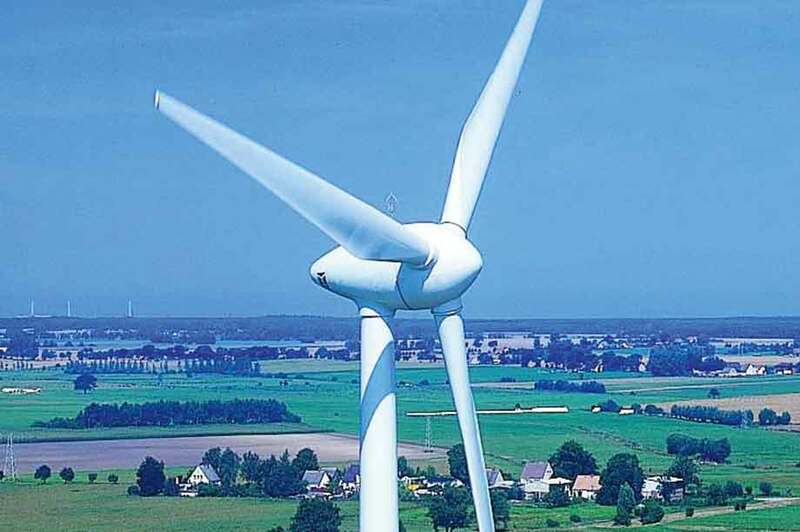 Enercon introduced the egg-shaped nacelle in 1995 with its 1.5MW E-66 turbine, and it featured on all later models, including the giant 7.5MW E-126, and the latest 4.2MW EP4 machines. The nacelle's elegant lines were the work of leading British architect Sir Norman Foster, and won high praise for its aesthetic appearance, especially in combination with Enercon's in-house designed concrete and concrete-steel hybrid towers. The iconic shape received a further boost in 2003 when Enercon introduced a new blade for its 71-metre rotor diameter 2MW E-70 turbine. This blade featured an optimised blade tip winglet, and a more slender aerofoil with an integrated spoiler at the inner base that fully extended to the spinner. The product's main market focus was on maximising energy capture. At Enercon's 25th anniversary celebration, company founder Aloys Wobben said the blade's maximised energy capture and optimal wind flow over the nacelle together allowed reaching the Betz limit of a maximum aerodynamic efficiency of 59.3%. The 3/3.5MW E-101 is the latest and largest Enercon turbine still fitted with the classic blade design incorporating a wide-base spoiler. For the 2.35MW E-92, introduced in 2012, and the 3MW E-115 (2013), the company introduced a new generation of slender blades with flat-back aerofoils. The spoiler on these blades is narrower, but extends over a longer distance of the inner blade and up to the spinner. 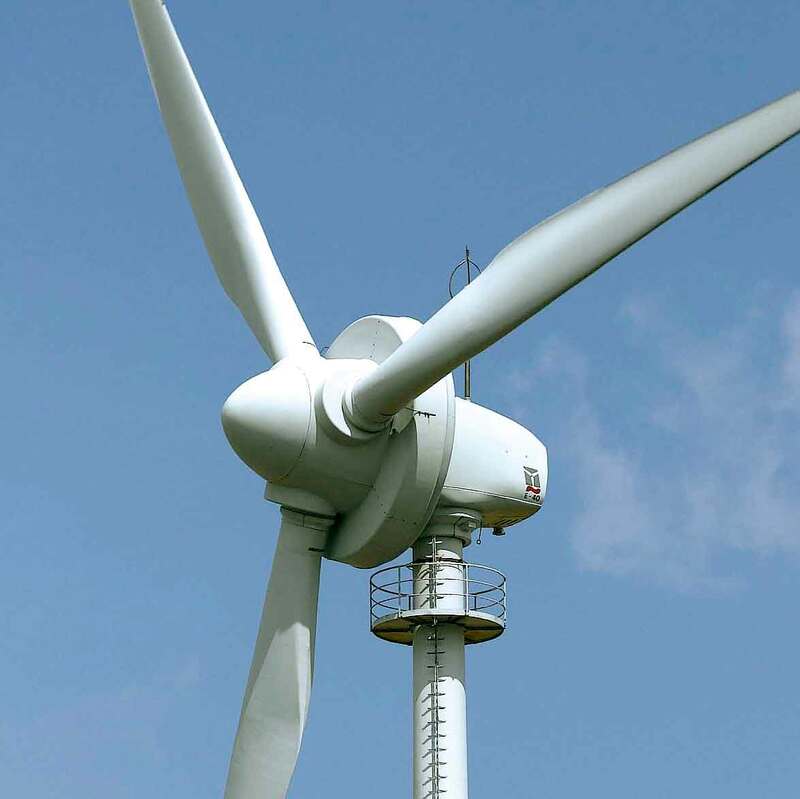 Segmented blades, with a steel inner and composite outer, were introduced for the 7.5MW E-126 turbine in 2007. The E-115 EP3 and the E-126/141 EP4 models come with slender and fully composite segmented blades.